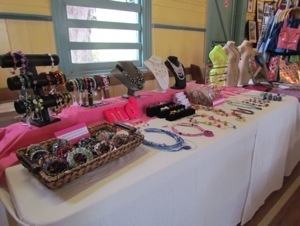 Today was my first market for 2013, and the first also for Woodbridge Village Markets. It was one of those rare days where people were talkative. It was a lovely change and I definitely appreciated it. I usually get to set up at this market on a Saturday afternoon which gives me a one up in case I need to add to or alter my display. Like I did this time. I don’t mind which tables I am given (I have a regular spot) but when I pack my boxes with a certain table in mind and it changes, it means re sorting props and a waste of time. I could of course pack everything I may need, but I want to keep my packing limited to the car boot which is 4 boxes. I changed my layout a little today. All my canvases stayed at home, and I took my bag rack. But then I had a normal table and a card table. Ahh, what to do. I fiddled around a bit and it all fit, but I will work on it for something better next time. And then ask that I get the same table each time. Puh-lease. It was awkward and left m out of whack. What I did take was a whole lot of bracelets and a new earring rack. Only problem there, my earrings are usually too long for the spaces allocated. Grr. 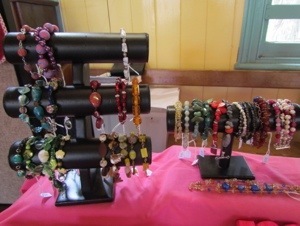 I have a 3 tier bracelet rack that is now full, plus my single tier which has the semi precious one on it. My basket of memory wire bracelets as chockers as I made 8 more, and the basket of $5 earrings was bursting. A few changes to make for next time. The bag rack will have only half as many bags, it was way too full and not really appealing, even though there were plenty of lookers, I think too crowded. I will also take my easels and pin the glass and polymer necklaces to those. Easier to see and label. Buy another bracelet rack, and use both my earring stands. Or make smaller earrings. As well as my 3 girls and any other busts I choose to take, (normally 3 small ones). I am not too fussed about the quantity of stock, the beginning of February heralds the Annual Middleton Expo, so having a full stall will be nice. I just need another table, a small one. The other good points for today. 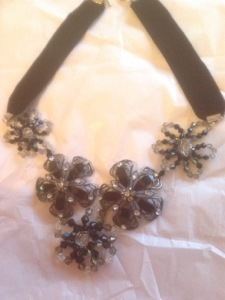 I sold a necklace that had been around a while and has always garnered lots of appreciative comments. (C’mon people, love it, buy it!) A wonderful, classy lady arrived that I know and really took to it. We tried it on her and it looked gorgeous. She said it was too dark for her, but it worked perfectly with her outfit, and she wore it so well. (Everyone else would say how good it was for an evening out, not this chick). Anyway, her husband says yeah, but looks too gothic on you. So she bought it for a daughter/grand daughter and I get to deliver it tomorrow along with a repair job I had done earlier for her. Bad photo, but you get the idea. Still a gorgeous necklace. The other times bought were put on and not taken off, I only wrapped one item to take away. Love it when that happens. 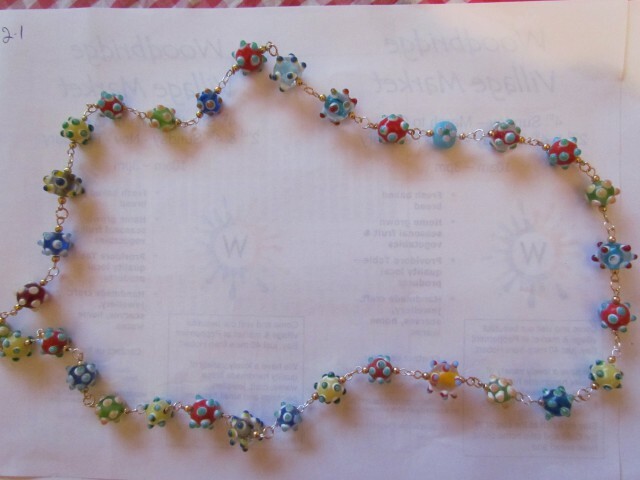 This entry was posted in Beading, Craft Shows & Markets and tagged Bracelets, customers, earrings, friends, jewellery, memory wire, sales, semiprecious. Bookmark the permalink.